As a therapeutic herb, ginger effects include anti-emetic, anti-nausea, anti-inflammatory, and antioxidant actions. Known for millennia by both Asian and Western apothecaries, many of the medicinal uses of ginger have been corroborated by modern science. Originally cultivated in Asia, where it has been used for thousands of years, the ginger plant's healing and culinary applications are widely popular today all around the world. For thousands of years, ginger has been used as a spice and popular herbal medicine in Chinese, Indian, and Iranian medicine. In India and China, ginger root has been used as a tonic for upwards of 5,000 years. In traditional Chinese medicine, fresh and dried ginger have widely different medicinal uses. While eating fresh, raw ginger allows you to reap its anti-emetic, expectorant, and immune boosting effects, dried ginger is commonly used for relieving stomachaches, diarrhea, and vomiting. In Indian medicine, ginger is referred to as mahabheshaji or mahauishadbi, which can be translate to mean the great cure or the great medicine and it has been used for millennia to treat a number of ailments. In the ancient Ayurvedic texts of Charaka, Susruth, and Vagbhatt, ginger is recommended as a cure for gout, elephantiasis, and indigestion, and it is still a very popular Indian remedy. 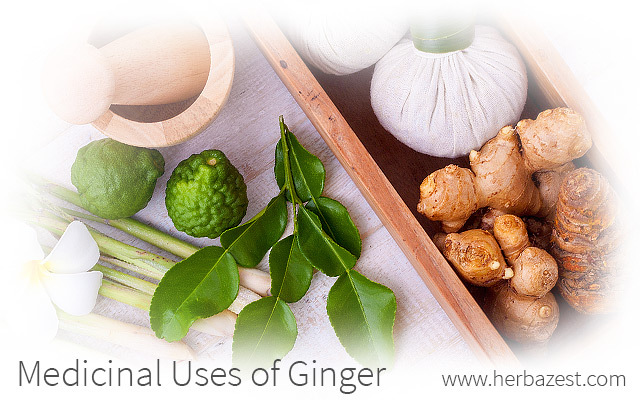 Ginger also has a history of medicinal use in traditional Iranian medicine. According to ancient Iranian manuscripts, ginger has applications as a tonic for memory, liver health, digestion, and diarrhea. It is also recorded as being prescribed as an aphrodisiac, as well as a remedy for paralysis and jaundice; however, science is yet to validate some of this ancient medicinal applications. DURING THE 13TH AND 14TH CENTURIES, GINGER WAS AN EXCEPTIONALLY PRIZED SPICE, AND ITS VALUE WAS EQUAL TO THAT OF A SHEEP. Though it was commonly used in the Middle Ages as a flavoring agent, much of ginger's value came from its medicinal properties. During the time of Henry VIII, ginger was even prescribed as a remedy against the plague. Ginger properties have been frequently used in the form of home remedies to treat nausea, vomiting, and dyspepsia. The use of ginger for inflammation is extended, since it has been shown to act as an efficient pain reliever and can be applied to relieve headaches, as well as the symptoms of arthritis. Ginger tea is one of the most popular ways of taking ginger as a home remedy. When taken hot, ginger tea helps to warm the body and trigger perspiration. When drinking ginger as a warm infusion, use 0.5 - 1.0 grams of dried rootstock to treat dyspepsia, or two grams if used as an anti-emetic. CHEWING FRESH, RAW GINGER HELPS TO STIMULATE SALIVA FLOW, THUS AIDING IN DIGESTION. IT CAN ALSO SOOTHE A SORE THROAT. Although this medicinal root is safe when taken in the right dosage, ginger side effects due to over-consumption may appear when taking more than four grams of per day in any form. Pregnant women should not take more than one gram of ginger per day and should always consult their doctors before use. The benefits and medicinal uses of ginger can be easily traced throughout history. Nowadays, science has corroborated many of its uses, and ginger is still a widely popular herb, used to treat a variety of health conditions.